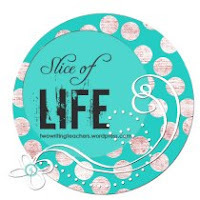 On Tuesdays, Ruth and Stacey host Slice of Life on their blog at twowritingteachers.wordpress.com. Feel free to write, link, and/or comment! On Friday, we hosted teachers and administrators from a neighboring school district who are considering implementing writing workshop in the fall. We have been an affiliate of Teachers College Reading and Writing Project for over ten years and at this point, our district's writing program is rooted in workshop practices. Initially, we met in the conference room and went over the history, rationale, systems, and structures that we have in place. Because I work within these structures every day, I don't always think about the groundwork that had to happen in order for workshop to be such common practice in our district. One of the principals wanted to know about getting teachers to buy in so we talked about how strongly we believe in the workshop approach. Beginning with those foundational beliefs is such a powerful way to bring people on board. Another visitor asked about explaining the workshop model to parents, another important component. Yes, parents do have to understand that their children's work won't be perfect and should not have adult corrections on it. 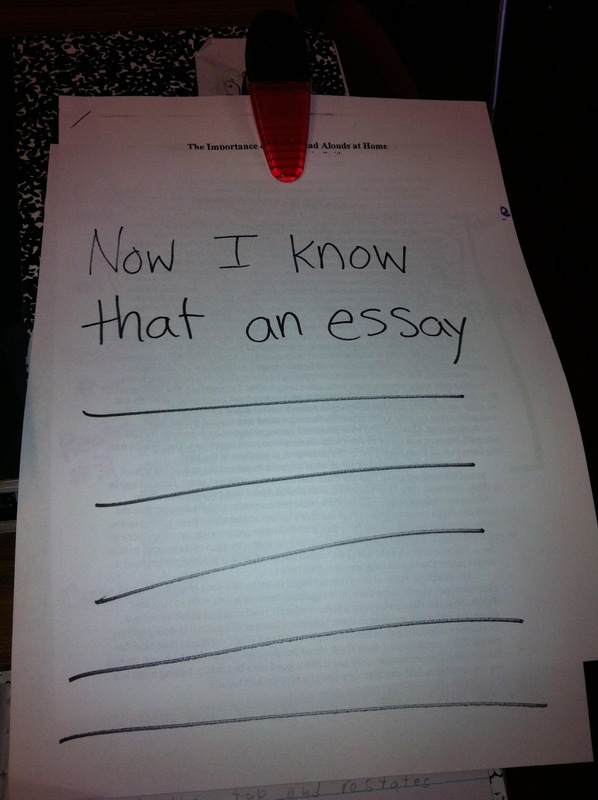 "Adults don't write on students' work?" someone asked. 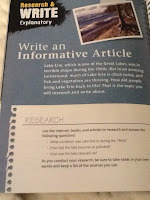 I know that this is a mind shift for people adopting a workshop model, but no, adults do not write on students' work and parents, as well as classroom teachers, special education teachers, tutors, para-professionals, and any other adult working with student writers need to become aware of this. Part of the visit included three classroom observations and we were all so impressed with the teaching and learning in the kindergarten, first and second grade classrooms. To see three classes in a row of different grades working on their writing is a powerful experience in and of itself--you see the development and progression of learners so clearly! To watch our visitors take in the independence, repertoire and sense of purpose that our young writers had was also powerful. Our teachers delivered their mini-lessons and then had time to answer questions and reflect on their practices because their learners are so programmed to work on their pieces and use available resources to cycle through the writing process. Our young writers were understandably proud of their work in progress and happy to share their challenges and inspirations with their visitors. I kept hearing people say that they couldn't believe the work that children were producing. I also heard our teachers repeatedly inviting our visitors from another district to take pictures, look at student work, read notebooks, and ask questions. I am new to my position as the district's writing coordinator, so I can not take credit for the high commitment we have to the writing process and the workshop model, but I can be incredibly proud and excited to be a part of it. Additionally, I am proud to be a part of an educational community that opens its doors and classrooms to colleagues from a neighboring district. It was truly a great slice of life and a model for professional practice. 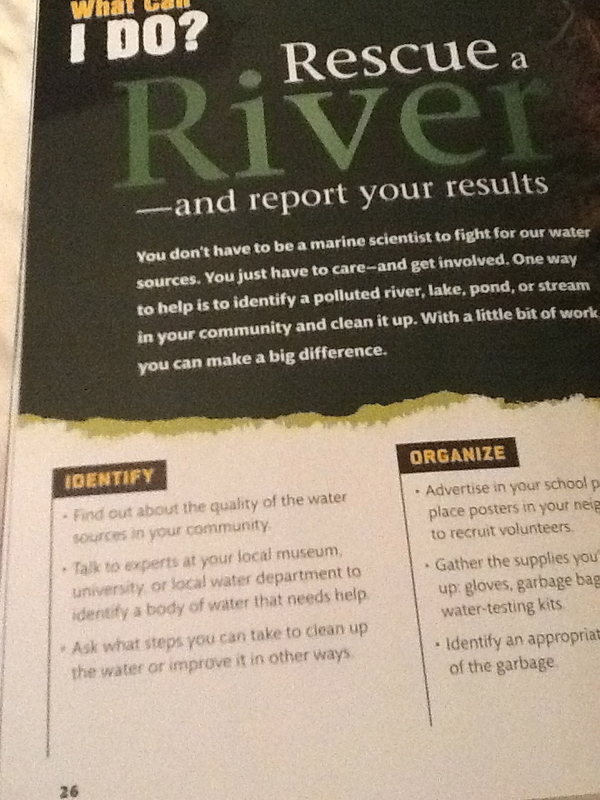 Over the course of the week, I have been reading samples of books from National Geographic that I picked up at the New England Convention for Social Studies. 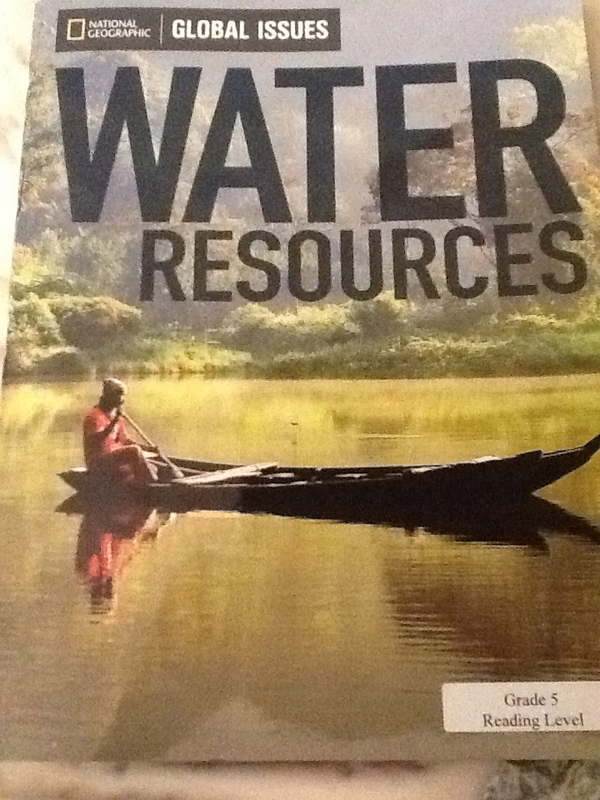 Because we are working on units that have to do with world geography, I zeroed in on the Global Issues Series. I can not recommend these books highly enough. There are twelve topics in the series, a total of 36 books since each topic has books written at three different reading levels. Some of the topics are globalization, food supply, energy resources, health, human rights, and several more. In addition to the Global Issues Series, they have also created products for many periods of American History that are well worth exploring, as the books are closely aligned with CCSS, they are engaging, and they have companion teacher texts. The publishers have created parallel texts at three different grade levels. I have read them several times and the differences are subtle, but significant for the purposes of differentiation. Aside from the text, the books have open-ended comprehension questions and, in addition to the core knowledge, two case studies that are different in the grade level texts. 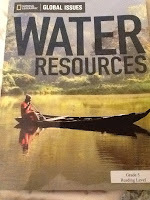 For example, the fifth grade level of Water Resources focuses on different geographical areas that the 6/7 level text and the Level 8 text. I can envision study groups presenting topics as classroom experts. I strongly believe in challenging students to become activists and each book contains a page about what we can do to help (see the page on the left). These books also contain writing projects (see the page on the right) that are aligned to Common Core State Standards at whatever level the students are reading. 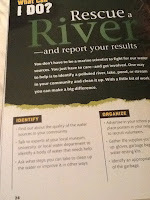 National Geographic has developed books aligned to both science and social studies units. These books can serve as amazing mentor texts, as well as resources for engaging and relevant information for our middle grade learners. If you haven't seen them, you should definitely link over to the website, and check them out! 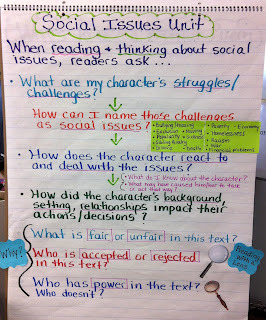 To read my previous posts on our social issues unit, please click below. After each unit of study, I have students reflect on their learning during the unit and think about which strategies/skills they can transfer and use in the next unit. 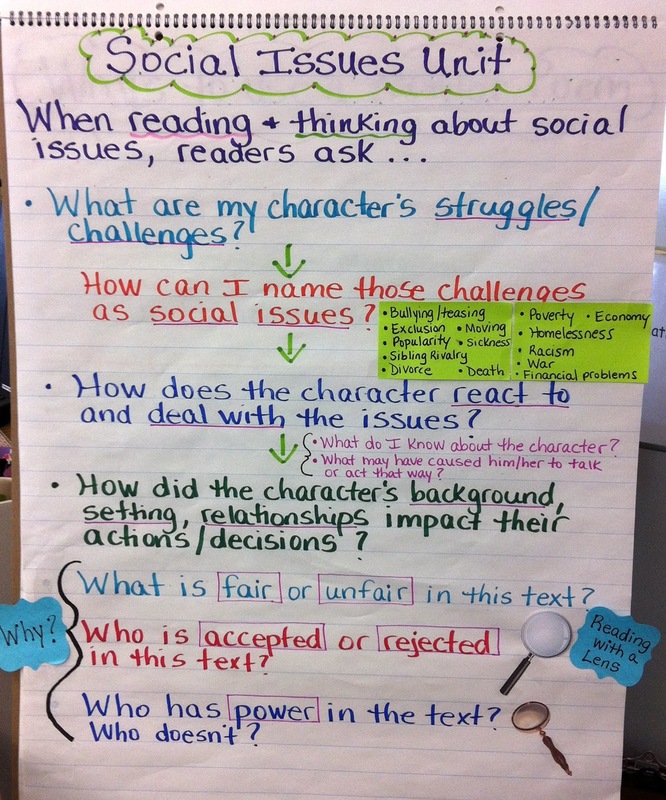 Before beginning our historical fiction unit this week in reading workshop, I had students reflect on our social issues unit. 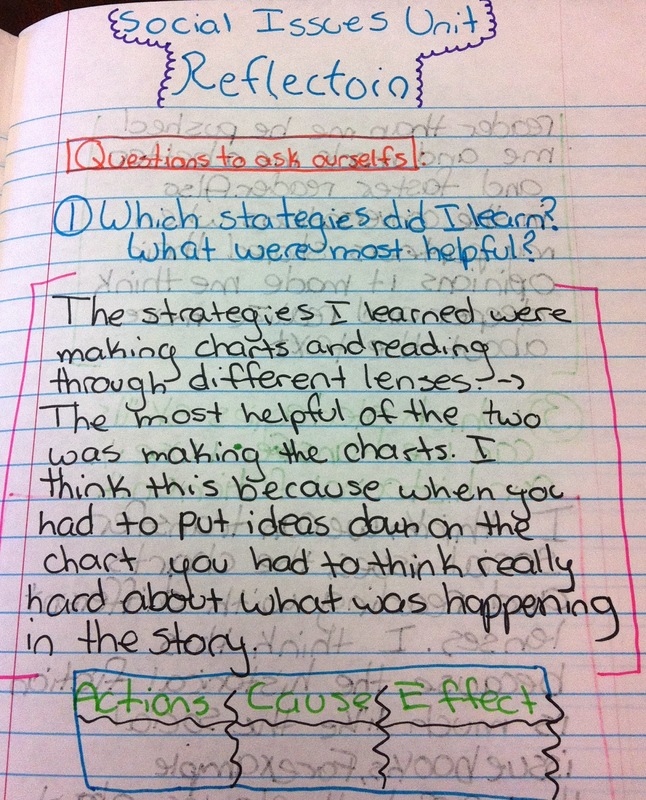 I have been modeling and teaching students how to reflect on their learning since the beginning of the year so they have begun to internalize the reflection process which is such an important life skill for them to have as learners. 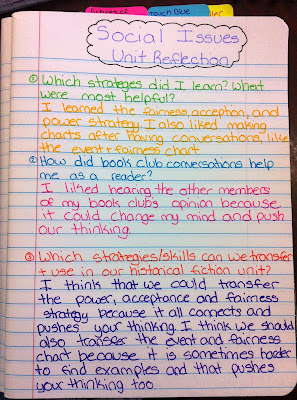 Which strategies did you learn in this unit that were helpful? How did book club conversations help you as a reader? Which strategies/skills can you transfer and use in our historical fiction unit? Then we discussed one question at a time and I modeled how I might answer the question as a reader and then students turned and talked to share their personal responses. All of our teaching points and strategy examples are on charts right near our meeting area so they were able to refer to those as they turned and talked to share their reflections verbally. After discussing each question and giving students a chance to see me model answering the question and having a chance to turn and talk with their book club, students went off to write their reflections in their reader's notebook. 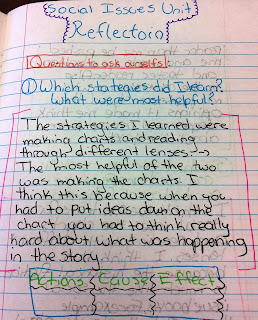 Each student has a section in their notebook for reflections. Pre-assessment is so important because you can see what the students know and don't know. Just give them an open-ended prompt and see what they do with it. You will learn a lot about what they know! "Ultimately, let's think about what is important and fun in conjunction with the (Common Core) Standards." When you launch a new unit, you just want a lot of energy--you want kids to be really wanting to get to their seats and write! When Christine finished her mini-lesson in about 9 minutes, she did not give students elaborate, precise directions. Off you go is a favorite line from TC and when she said this, the students went off and evaluated, rated, and wrote about their collections for over 30 minutes. Mini-lessons have become more balanced in the Writing Workshop with shares, conferences and strategy groups, other important learning opportunities. Christine used the share at the end of the workshop to make an important teaching point. Inquiry lessons are gaining importance, as well, where students look at mentor texts and examine them for what makes them effective. Warning: If you have to do too much fishing for the "right" answer, then you probably are not ready for an inquiry lesson and you should return to direct instruction. Students have to know some things about the subject before they are ready to name the traits. Whatever unit you are in, you are working on qualities of good writing and process. 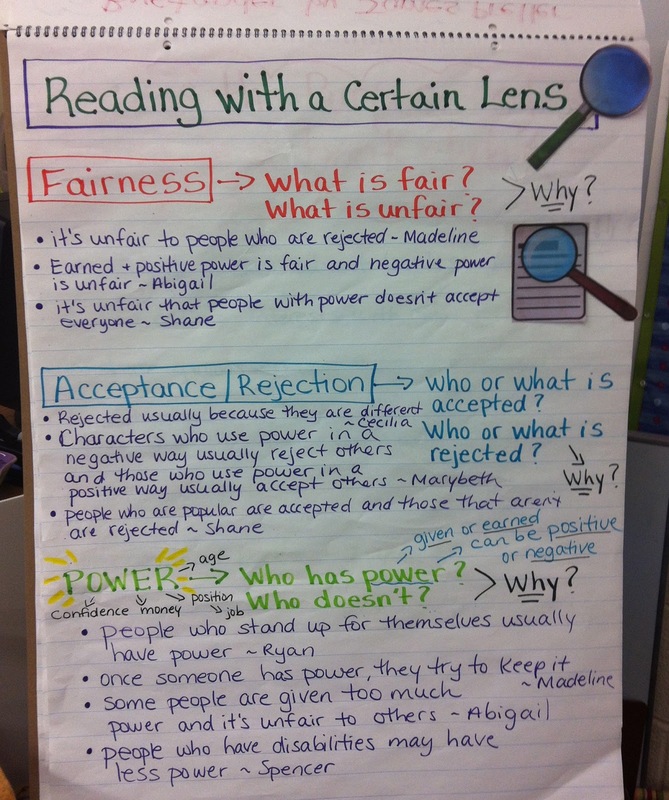 In any unit, are students planning, re-reading, learning about qualities of good writing? 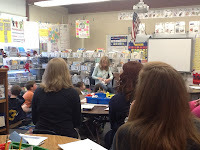 As part of the new Opinion Unit that will be described in detail in the new Units of Study writing books that should be released at the end of May, first-graders bring in collections and rate them before they get to writing. Christine taught the launch to our students in two classrooms and, I have to say, if the energy stays anywhere close to what it was yesterday throughout the unit, those children will be effective reviewers and evaluators by Memorial Day! 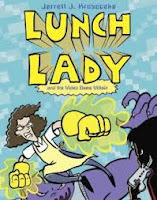 My class was very fortunate and lucky to win a signed copy of Lunch Lady and the Video Game Villain #9 by Jarrett Krosoczka before it was published! It comes out this week on store shelves so definitely pick up a copy. I love the Lunch Lady books and have read them all so I was equally as excited as my kids in classroom to get my hands on this book to read. Of course I had to sneak it to read it one night because it was always being read by one of the kids during the day - never made it to shelf in class library! The ending in this book leaves you in complete suspense so I can not wait till book #10 to find out what happens to Lunch Lady and Betty! 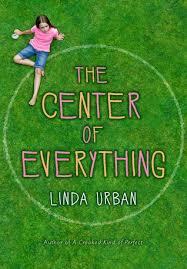 The Center of Everything by Linda Urban is a beautifully written book. The main character, Ruby Pepperdine, is an 11 year old girl who is anxiously awaiting her twelfth birthday so she can have her wish come true as she reads her winning essay at the Bunning Day Parade in town. She is a superstitious girl who perseverates on things she has said or done in the past and has the "should have, could have" thoughts in her head. In particular she misses her grandmother Gigi and wants to relive the last moment she had with her before she passed away because she regrets the moment. She is hoping that her wish will be granted on the day of the parade as she reads her winning essay. The Bunning Day Parade is a town tradition and means a lot to her family and to her grandmother Gigi. Flying the Dragon by Natalie Dias Lorenzi is a powerful story about a young girl named Skye who was born and lives in the United States and her cousin Hiroshi who has always lived in Japan. Skye's father is Japanese and lived in Japan until he married her mother and moved to the United States. Since Skye has always lived in the U.S., she considers herself American and not Japanese. In fact, she even changed her name from Sorano to Skye to "Americanize" it. She eats American food and only speaks Japanese once in awhile when her father makes her, so it is pretty rusty. There are big changes when Skye find out her grandfather, uncle, and cousin, who she has never met before, are moving to their neighborhood from Japan. Her father has not seen or talked to them in years because of a family disagreement so he is excited to bond again with his family members. Since they only speak Japanese, Skye must go to Japanese school on Saturdays to learn the language better so she can talk to her relatives. As Skye is struggling to learn Japanese so she can be Hiroshi's translator at school, Hiroshi is struggling to learn English and to fit in to a brand new culture. Both of them are not happy at all under the circumstances and at first take it out on one another. However, they begin to have realizations and things begin to change... I love how this book rotates between a chapter from Skye's point of view to a chapter from Hiroshi's point of view. That set-up really ties the book together nicely. I also read the poetry book, This is Just to Say: Poems of Apology and Forgiveness by Joyce Sidman. I have had this book in my classroom library for years, but for some reason it slipped through the cracks and I never read it cover to cover. I loved this book and can't wait to read it aloud to my class this week! I love how on one page there is an apology poem for an action and then on another page there is the forgiveness poem in reply to the apology - very clever poetry book! Having been on vacation last week gave me a lot of time for reading and I was able to read some books that have been on my list. 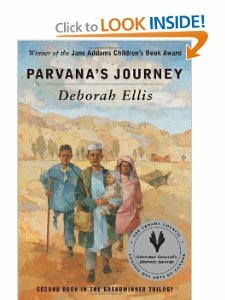 I read Parvana's Journey and Mud City by Deborah Ellis, the second and third books of a trilogy that begins with The Breadwinner. 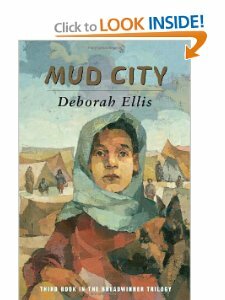 These books tell the stories of fictional Afghani girls in the years just before 9/11. Although the accounts are incredibly sad, the events are appropriate for upper elementary and middle school students. My high school daughter read them as well since she was looking for a book to read and she had a lot of questions about the Taliban and events in the Middle East. She was angry at the sadness of the stories and the lack of closure, but appreciated the parallel of this uncertainty to the real-life events within this area of the world. Thank you to Tara for the recommendations. I also read Between Shades of Grey by Ruta Sepetys, another extremely sad book about the plight of the Lithuanians during World War II. I have studied Hitler and the Holocaust, but was much less aware of the atrocities of Stalin and his deportation of millions of people from Lithuania, Latvia, and Estonia. This book is more appropriate for high school students or mature middle school readers since there will be some predictable questions about behavior of people in power. 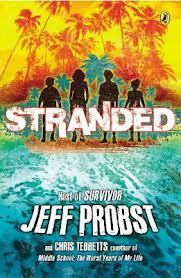 It's beautifully written and I am sure that the characters will stay with me for a long, long time. Back to work today...Happy reading! 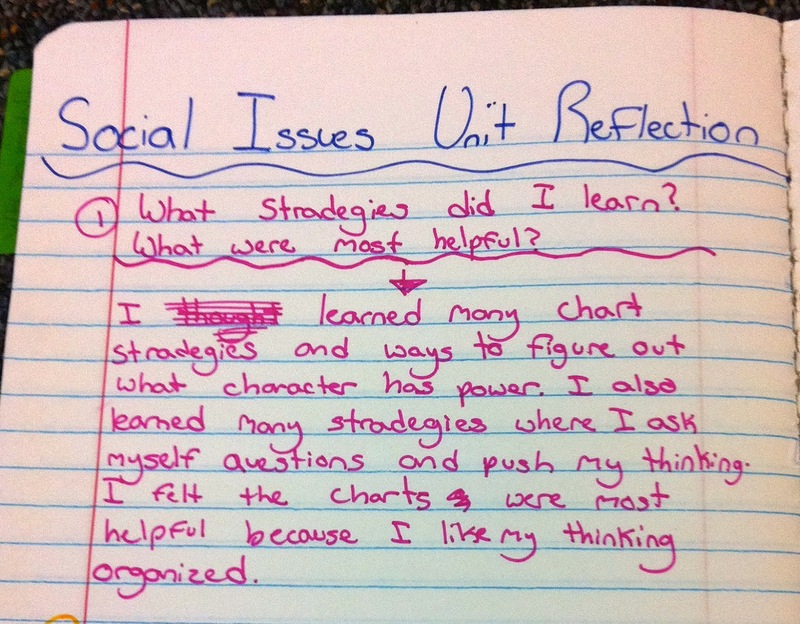 A few weeks ago, I wrote about the launching of our social issues unit and shared some of our initial charts at the beginning of the unit. To read the Social Issues Book Club Unit : Part One, click here. We are currently culminating our social issues unit and book clubs had their last book club conversation on Friday. 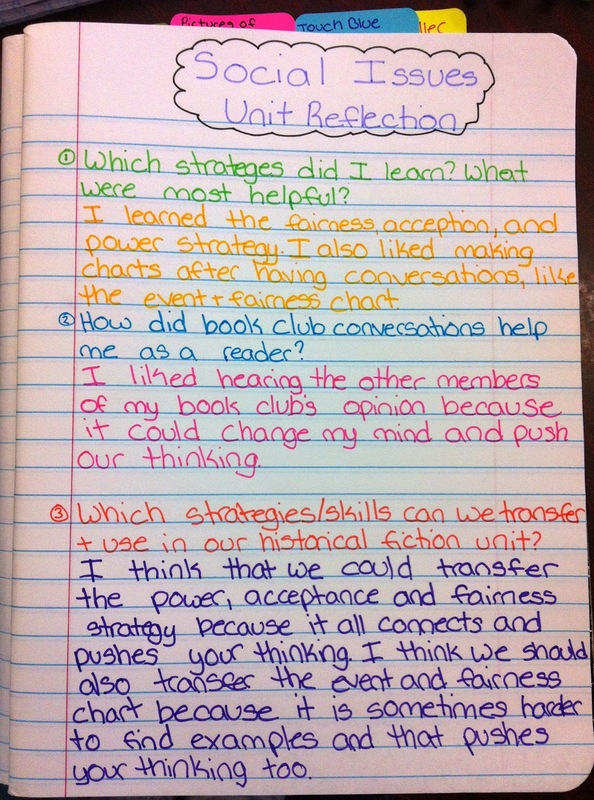 After our April vacation, students will be reflecting on the unit by thinking about what they learned as readers throughout the unit and how the book club conversations impacted their thinking as a reader. 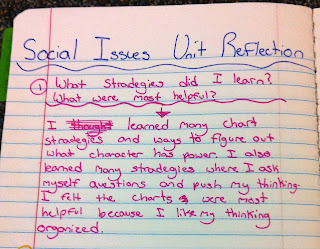 Stay tuned for a post about their end of unit reflection next week. 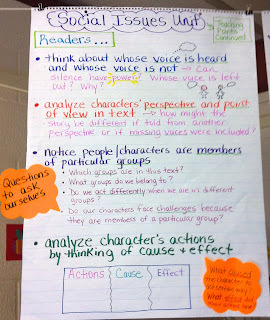 Below are some of the charts we created as a class throughout the unit as well as a photo of the book club wall students created to share their thinking with all of their classmates. This was a great way for book clubs to share strategies and charts they were using and creating to deepen their thinking as readers. 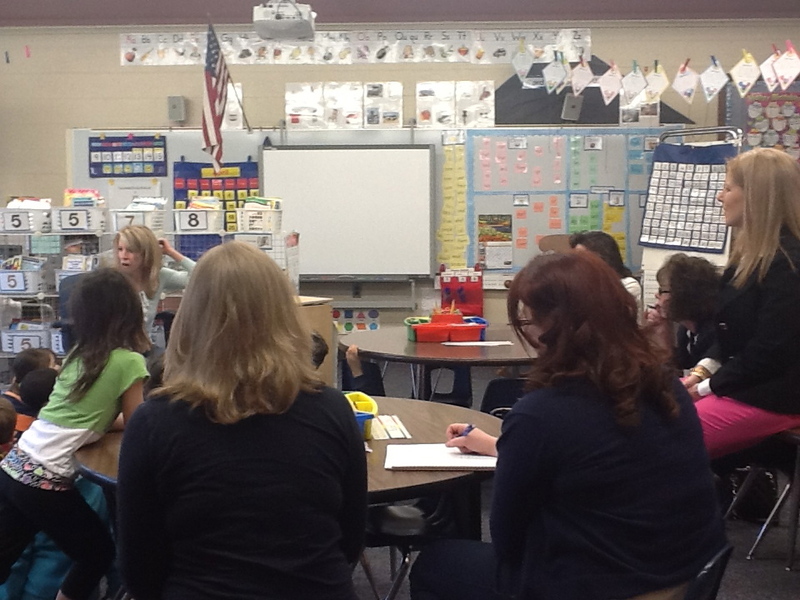 It was also a great way for book clubs to teach and learn from each other. Last week, I was in Kim Wolf's fourth-grade classroom as she was having her students debate the issue of whether children should have cell phones. This lesson is part of the curriculum that we use from Teachers College Reading and Writing Project and is one of the earlier lessons within the Research-based Essay. A great description of how to run a debate is available through the website which I have linked here. There are also several articles and description about the importance of having students learn the skills of debate which you can find by searching debate on the website. Students had read several articles about the pros and cons of having cell phones during previous lessons. From these articles, students took a stance. Surprisingly, Kim's class split evenly, although she had been prepared to challenge students to try out the opposing side if she had needed to. Kim and I coached the students as they caucused and used this time to teach them about using boxes and bullets to organize their thinking. Students frequently struggle distinguishing between reasons and examples so it helped them to have reasons in boxes and examples following the bullets. I wish that I had taken a picture of the students lined up to debate, but imagine ten pairs of students facing each other. The pro-cell phone arguers went first for a minute, followed by a minute for the anti-cell phone students. Many students ran out of things to say before they ran out of time and they realized that they would need more evidence and examples to support their reasons. The students who didn't finish their talking mostly tended to be redundant. Kim gave the groups time to caucus and share the arguments that they had heard. In my group, there were a couple of clear "dominators" although these students did try to engage quieter students in the conversation. While they were interested in hearing me model the phrase "you said ______ but the fact that _________ weakens your argument", this phrase was difficult for them to use. The students were more successful with gathering more examples and evidence before they had 30 seconds for rebuttal. changed based on listening to the opposite side. The reflections were insightful and varied so when the students shared some of their writing in a closing circle, it led to a conversation about citizenship and democracy. The lesson concluded with the strong message that listening, reflecting and understanding other perspectives are important skills to develop in our complex and diverse world. Are There Lessons From a Controversial High School Tradition? Assassin has come to our house. For those of you unfamiliar to the game, this is the high school tradition where they pair up, pay $20 to play, and are given teams to try to shoot with water guns before the teams who are after them can douse them first. The winners get the money which is a substantial sum--I believe that the purse is over $800 this year. I would support banning this game for many reasons. Mostly, I worry about the safety of these teenagers because they will go to great lengths to get each other. While they are not allowed to chase anyone in a car, they are allowed to stalk, restrain, lure, and lie in order to move on in the tournament. I could continue to make my case against Assassin because of the distraction that it provides at the end of the marking period during a year when grades matter a lot. I could also bring up the fact that Obama was in Connecticut, fifteen minutes from my house, to talk about gun laws and my peace-loving daughter is making sure that her water gun is within reach whenever she goes out. I could also mention that our high school principal sent an email to parents reminding us to talk to our children about the rules and the common sense that must accompany playing in the game. However, I will try to find the lessons that I can about teaching. You should see how motivated these teenagers are and the skill sets that they are using to strategize and try to win. I don't think that this is really about the money because the chance of winning is so small; the motivation comes from the competition. Listening to the conversations that all of her friends are having (and they are ALL talking about this) they are collaborating, communicating, and thinking creatively. Yes, I wish that their conversations had a different focus, but they are forming alliances with people they don't normally work with, trying to think of other perspectives, paying attention to details, and studying patterns. Hmmm. These skills sound familiar. And important. A teacher gave a lesson about symbols in literature and said that the students' job was to find a certain number of symbols in books. Use each other, the library, the internet...whatever they need, but come back able to explain ten symbols in literature. Perhaps early finishers could get extra points. A teacher gave a lesson on a concept or strategy and then assigned a problem set. You can use any resources to figure it out and if you do it in a certain amount of time, then you get a certain grade. Write an informational report that meets the Common Core State Standards on a given subject. The report can be on any subject and students are allowed to help each other, but every student must be able to explain the annotations that should accompany the report and clearly demonstrate the Standards. I think that I could continue a list, and I could tailor it to specific grade levels. The TedTalk, Build a School in the Cloud by Sugata Mitra supports inquiry-based learning and the concept that if we give students complex problems and ways to figure them out, they will learn much more than we would have thought. I also think about Tony Wagner's claim in his book Creating Innovators that engagement and high learning rates happen when people have passion, purpose, and play. Assassin presents teenagers with a complex problem and passion, purpose and play. How can we transfer this high level of motivation and engagement into classrooms? 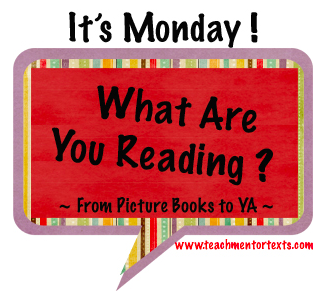 I've been reading books that will work with some of the social studies curriculum that I've been working on and this week, I read several, but two that I will share here. The Breadwinner by Deborah Ellis is the first of a trilogy about a girl living in Afghanistan within the last fifteen years. Thank you so much to Tara for this recommendation! Parvana, the main character, introduced me more intimately to the plight of people living with the Taliban. Many of the books I read were longer than this one, and I appreciated the concise, but high-impact story. I have the next two books in the trilogy on my nightstand and I am sure that I will need to hear about Parvana's survival before next week. Our school media specialist put this next one in my hands and I am so glad that she did! The Matchbox Diary by Paul Fleischman is an absolutely beautiful book about immigration to the United States. This book could not only be used within an American history unit, but also would make a great mentor text because the grandfather saves important mementos and uses them as the foundations and inspirations for his memories. 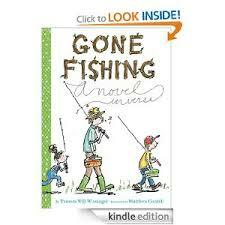 I was excited to find Gone Fishing: A Novel in Verse by Tamera Will Wissinger and Matthew Cordell because we are in the middle of our Poetry unit in writing workshop, I love finding novels written in verse to share with students, and I have a few students who are passionate about fishing too! 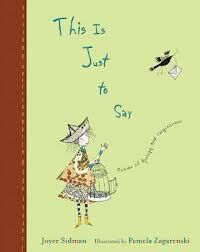 I loved reading this book this weekend and can't wait to read it aloud to my class this week. Each poem names the type of poem it is right under the title and the story is told so well through the poems. In the back of the book is a great treasure for the reader: A Poet's Tackle box! This is a toolkit for poets to use as they write their own poems. It includes descriptions of poetry techniques as well as detailed explanations of all the poetic forms that were used to write the poems in this novel. Enjoy! 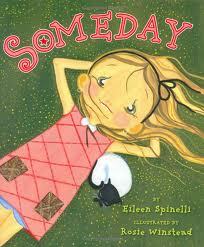 I read Someday by Eileen Spinelli years ago when it came out, but reread it last week with a different lens. This time, I reread it using the lens of a mentor text for poetry. I read it aloud to my class last week and had students pay attention to the repetition and the patterns Eileen Spinelli uses in the text. I love how this book switches back and forth between future and present tense and how it clearly shows how we all dream of what we want our life to be like in the future. I have some students who loved the pattern of "Someday... Right now... Someday... Today..." and are using it as a mentor text to write their own poems. 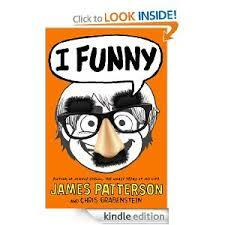 One of my students bought a copy of I Funny by James Patterson for our class so I took it home to read this weekend before giving a book talk to the class and adding it to our "New Books" basket on Monday. This book is hysterical and kids will laugh out loud while reading it! Students will enjoy laughing along with the main character, Jamie Grimm. Although Jamie has a great sense of humor and loves being a comedian, he is facing some challenges in life like being in a wheelchair and living with an aunt and uncle instead of his family. He is also getting bullied in middle school to top it all off, but uses his jokes to help that situation. This is a great book for middle grade students and will make them laugh, while teaching them important life lessons! As the Writing Coordinator in our district, I don't always get to teach lessons but I love hearing from the teachers about how a lesson, especially one within a new unit goes. Yesterday, when I stopped into a classroom before school, one of the teachers shared the lesson that she'd done the day before and was happy to hear that I would blog about it. 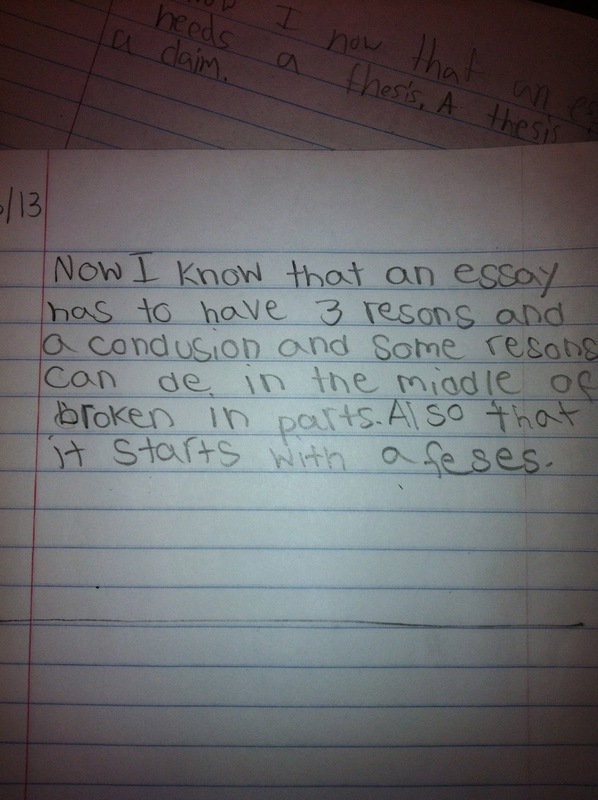 We are beginning a unit on research-based essays in fourth grade, but the students do not have much experience with writing essays, so, with the guidance of out Teachers College Staff Developer, Emily Smith, we developed a weeklong introduction to the concept of essays. The class started with whole-group instruction annotating a mentor essay that Emily had written. With her students, this teacher had students identify the thesis statement, the reasons, evidence, topic sentences, and the conclusion. After the whole class instruction, students went off with another mentor essay to mark up in partners and individually. (I did not photograph these, but the process was similar to the one shown above.) Some of the students worked in small groups so that the teacher could provide more instruction to them, while others worked independently so that she could make sure that they were understanding the concepts of an essay. While certainly one of the assessment take-aways is that the student on the left needs to learn how to spell thesis (make sure you look closely at the response on the left! 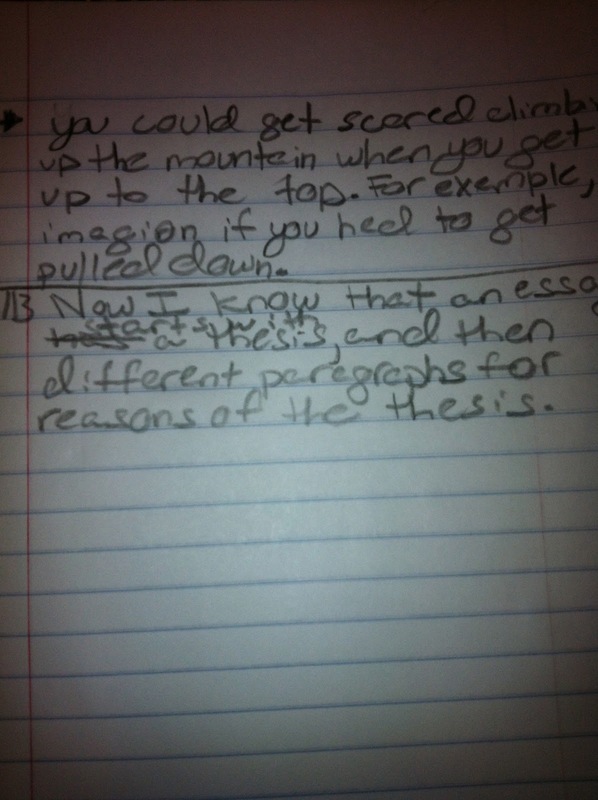 ), these quick assessments definitely showed that students are understanding the important concepts of essays. On Monday, the plan is to teach "Claim and Frame", a box and bullet strategy. I can't wait to see what students learn!